I've seen men who are toivel daily or on Erev Shabbos for "tosefes kedusha" have different minhagim for how often they toivel. Some people make sure to fully dip 3 times and some have some other number patterns they follow (seven, forty etc). What are the different reasons for these numbers? Is there an agreed basic obligation? You should dip once, as the Rambam says in הלכות מקואות - פרק ראשון that somebody who dips more than once is behaving inappropriately. The Kesef Mishne explains the reason: It looks like he's bathing or cooling down (or warming up or exercising, depending on your type of Mikve. My addition.) instead of purifying himself. As a result, people will think that Mikve - and touching items that require one to be purified - do not require concentration. So we see that even for Trumah and Kodshim - which require absolute purification in a Mikve - dipping once is all that is required. Anybody who dips more than once will need to explain himself. Rabbi Isaac Yehuda Yechiel of Komarno suggests the following intention: he writes in his Shulchan HaTahor pg.172 in ha'arah 16 brings from the The Pri Eitz Chaim(Shaar Shabbas 84 and Shaar Hakavanos pg.73) the intention for the initial immersion is that water has the ability to extinguish. We should ask God that He allow the waters of the mikvah to extinguish the burning desires to do bad, the fire of the wrong passions. The water should dowse the flame of anger, of hatred. By the second immersion, we should have in mind to accept fully the sweetness of Shabbos, the holiness of Shabbos, which the rebbe explains is the "mystery of the fire of God". This is talking about Erev Shabbas,however, regarding Shabbas morning he writes that one dip is sufficent. As mentioned above in Dannys answer, the Rambam says to dip once and more is a problem. However, recent acharonim recommend different amounts. 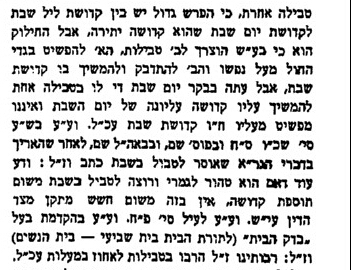 Though I don't have a source on hand, I once saw a letter from R' Chaim Kanievsky (about 10 years ago) that says that one should go to the mikva every day, dip twice and when going on Fridays, he should dip 3 times. Once in honor of Shabbos. Its also written in the Sefer Haminhagim of Spinka, that the second Spinka Rebbe (Chakal Yitzchok) would say that dipping less than three times doesn't accomplish any Tosefes Kedusha. Not the answer you're looking for? Browse other questions tagged number mikvah-ritual-bath . How many T'fachim make up an Ama? How many censuses happened in the desert? How many Shevah Brachos se'udahs do I have to make?